GOSHEN, Ind. 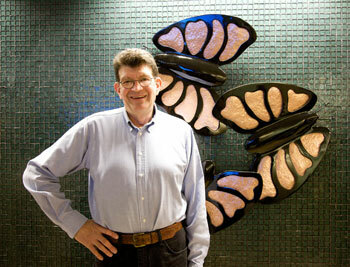 – Goshen College Associate Professor of Art John Mishler recently created a commissioned sculpture of three butterflies. It now hangs permanently on the wall of the Memorial Hospital main entrance lobby in South Bend, Ind., representing the shape of lungs and showing that the breath of life and hope exists in all people. This artistic celebration of life was donated to the hospital in memory of Jim Zuber, by his wife Diane Zuber, and was unveiled in a special dedication ceremony on May 2. Jim Zuber was a member of Memorial's Second Wind Lung Support Group. The artwork also honors Second Wind charter members Bill Snyder, Barbara Guy and Mary Bonin. The wall sculpture is made up of three aluminum butterflies that were painted black and had wings that were in the shape of lungs. The shapes of the wings were made out of hammered copper and many of them were heart shaped. "The piece was mounted on the wall to reflect flight reaching upwards to hope," said Mishler. Mishler, who teaches sculpture at the college, has also recently created commissioned artwork for the City of Dowagiac, Mich.; Northeast Indiana Innovation Center in Fort Wayne, Ind. ; Purdue University in West Lafayette, Ind. ; City of Palm Springs, Calif.; and West Lafayette, Indiana's city park.